A regular assessment schedule is part of the human resources policy of a growing number of companies. By appraising performance through interviews and management reporting, it becomes possible to build a comprehensive picture of staff performance, and isolate any particular problems before they grow to serious proportions. The inclusion of profiling in this process to develop a DISC assessment regime can further enhance its effectiveness. If a particular individual shows marked shifts between their 'Internal' and 'External' profiles, this is an indication that they feel somehow uncomfortable in their current position. This might indicate that they are unsuitable for their present work, but at least as often, it simply reflects an inaccurate perception of the requirements of their position. Discovering which of these possibilities applies in a given situation can usually be achieved by comparing the profile series with a 'Job Profile' for the staff member's role. The appearance of a 'Compressed Profile' in a DISC profile series is often a pointer to some kind of long-term pressure situation. In a work environment, a Compressed Profile is often a pointer to a lack of direction or certainty, suggesting that the person concerned feels unsure of the expectations of their colleagues and managers, or the nature of work that is expected of them. Calculating the stress levels within a DISC profile series can often be a useful indicator of a person's state of mind. It is usually possible to assess whether any stress stems specifically from the work environment, or is associated with the individual's general lifestyle. In either case, high levels of stress will have a detrimental effect on performance over the long term. Where a large number of people working within a department show very similar External Profiles to one another, this is suggestive of a subtle problem. Managers with very strong styles (especially dominant and highly assertive ones) can have a significant impact on their staff, to the extent where an entire department's External Profiles adapt to meet the manager's expectations. While this phenomenon might actually be desirable in a highly structured environment, it is often associated with problems of motivation. This is because members of staff are being forced to suppress their natural abilities, impacting on their performance. Large shifts between the Internal and External profiles can also decrease motivation, again with a negative effect on performance. 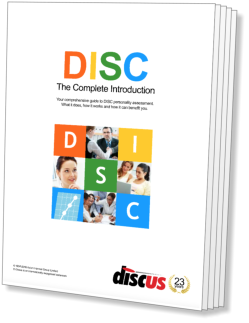 Assessment programmes using DISC should not be performed at close intervals. This is not normally a problem, because such assessments would normally be performed at six-monthly or annual intervals. As an absolute minimum, a DISC questionnaire should not be applied on the same person at closer intervals than three months.